Adequate rejection of the image frequency. To pass through the wanted signals with as little as possible loss. To limit the un-attenuated bandwidth presented to the mixer in order to minimize second and to a lesser degree third order IMD and any other possible sources of spurs like the IF and its sub harmonics and countless other heterodyning high order products. This means that at the image, the rejection should be infinite (>130dB) preferably, and elsewhere outside the pass band the rejection should be sufficient to put 2nd and 3rd order IMD and other evil products below the noise floor. Low insertion loss, high stop band rejection and narrow bandwidth with little built-in IMD are all conflicting forces, so BPF design is all about compromises, and alas 'infinite' does not really exist! At the lower bands the built-in IMD is a problem while image rejection and IL are not. At the higher bands image rejection becomes more difficult together with low IL and also IMD is mounting again! The optimum for the image, the IL and last but not least IMD turned out to be around 40M and 30M, where the H-Mode mixer peaked also and dynamic range is most important. Depending on the band more poles are needed to give enough image rejection. 160M up to 20M only require 3 resonators to supply > 100dB theoretical image rejection. 17M up to 10M require 4 resonators and 6M requires 5 resonators and still does not quite reach the desired 100dB. For reproducibility reasons I have not pursued this path any further and decided to use 3, 4, or 5 resonator filters. They have inevitably more IL but are far better to reproduce and give quite acceptable results. Image rejection preferably close to 100dB or better. Total combined IF rejection more than 130dB. Insertion loss less than 2dB. 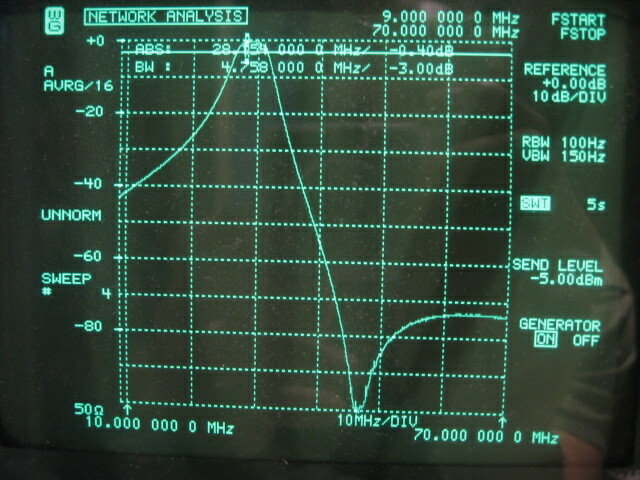 Insertion loss as flat as possible (0,5dB) over the entire band in question. The IMD introduced by the filter less than the IMD produced by the rest of the frontend. The loaded Q preferably less than 10 to keep the flux and IL low. The inductance of the coils should be as high as practical to increase the number of turns needed and hence reduce the flux and IMD. The biggest toroids of the lowest mu material should be used to help keep the IMD down. Shielded coil formers by Lodestone Pacific, although convenient in many cases, have not been considered anymore after the tests on 40M. On the lower 4 or 5 bands the number of turns needed to obtain the required inductance is so large that even with thin wire multiple layers are needed. Multiple layers increase the capacitive coupling and thin wire increases the resistance and both effects make it very difficult to obtain a reasonable Q. On the upper 5 bands it will probably be possible to produce single layer coils with reasonable Q with the Lodestone formers. However the motherboard approach also makes the use of shielded formers less desirable from a mechanical point of view. The different filters are totally shielded from each other by design already. The shielded formers require a through-hole approach which is undesirable here and furthermore the orientation will be such that the coils cannot be tuned when the board is plugged in! The big toroids don't have these issues and give best IMD performance and high Q by far! A piece of 10mm angle brass connects the ground plane of the BPF electrically and mechanically firmly to the mother board ground plane. The male PCB header connectors are not really used for ground connection. The small inductance to ground introduced with those connectors destroys good stop band characteristics. The brass also gives a stable mechanical connection. M2 screws through the mother board firmly connect the BPF to the mother board. The back side of the PCB is the filters ground plane and prevents individual filters to couple in to each other. The back side of the PCB however has vertical cuts in the copper to prevent ground currents to flow from underneath one toroid to the next toroid. Without these cuts the stop band did bottom out around -90dB. With the cuts the analyzers -100dB noise floor could be reached. There is no copper directly underneath the toroids on the component side and they are lifted by 2 small pieces of FR4 1.6mm material above the PCB and secured in place by two tie-wraps. 4 connector pins are used for the signal path. 2 times 2 are used for the relay control. Hopefully this will give some extra redundancy to prevent connector problems. Good quality Suflex 2.5% Polysterene capacitors are used. Dipped mica will probably also do equally fine but I have not tested that. Stay away from low quality ceramics! There are no trimmer capacitors. Fine tuning is carried out with the distribution of turns around the toroids. This is quite feasible when the inductor has been tuned to approximately the right value with AADE LC meter IIB. N2PK VNA (or any scalar analyzer) is very helpful to fine tune the filter with a flat response over the entire pass band. Small SMD signal relays are used with very good RF signal properties. (Tyco/Axicom IM06GR). The relay contacts are DC wetted in both the filter-OFF and the filter-ON condition. The board size is a 1/2 height a eurocard: 16cm x 5cm. These boards all use similar layouts with 3, 4 or 5 series resonator sections. The biggest toroids that will fit are respectively T106, T80 and T50. The following N2PK VNA + Exciter artwork shows the filter box in action with all 10 filters plots shown together in a wideband transmission plot. The image rejection is actually < -100dB on all bands except on 160M (-93dB) and 6M (-72dB). Due to thermal drift slightly invalidating the VNA's calibration over time while sweeping all BPF's the ultimate stop band appears to be a bit less good in this picture than can be measured for each filter separately. 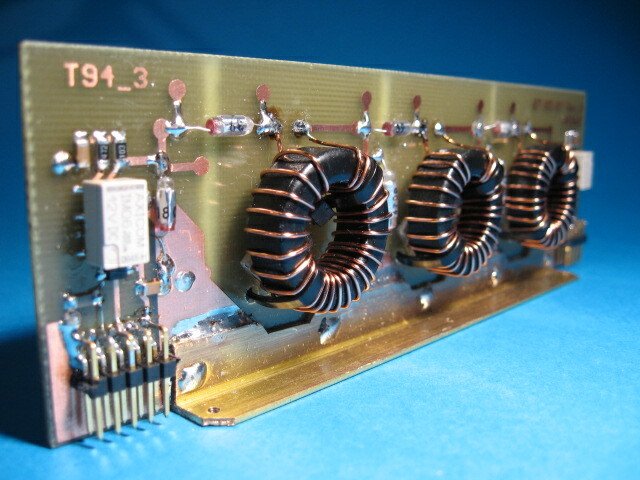 Note the action of the 9MHz notch filter which is especially needed on 30M, 20M and 17M! Although the BPF's are relatively wide (Ql < 10) the graph shows that these filters are not to be compared with a general coverage half octave BPF solution.